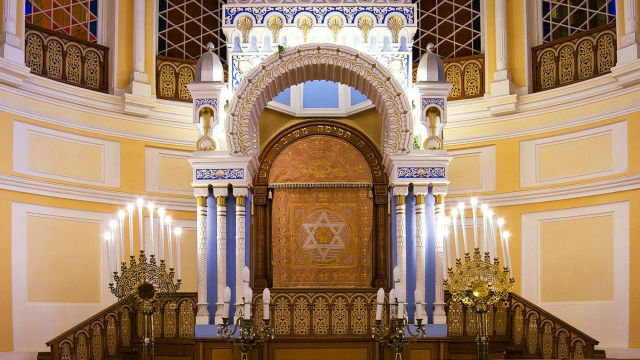 Example of a Jewish Synagogue, not the one targeted in the story. This is the Choral Synagogue interior in St. Petersburg, Russia. Public Domain photo via Pixabay. An Irvine synagogue was defaced with anti-Semitic graffiti overnight, just days after the massacre at a Pittsburgh synagogue that claimed 11 lives. Employees arriving for work spotted the vandalism about 9 Wednesday morning at Beth Jacob Synagogue, 3900 Michelson Drive. “We think it happened overnight,” said Kim Mohr of the Irvine Police Department. The vandal spray-painted “(Expletive) Jews” on the synagogue, said Rabbi Yisroel Ciner. Police were analyzing grainy surveillance video footage that shows someone jumping or throwing something over a fence on the synagogue property, Mohr said. So far, the image isn’t clear enough to provide a suspect description, she said. The founder and dean of the Simon Wiesenthal Center in Los Angeles condemned the desecration of the Beth Jacob synagogue. Anyone with information about the vandalism was asked to call investigators at (949) 724-7200. The number of hate crimes in the region jumped last year, continuing a trend that began in 2015, according to the OC Human Relations annual report.